This tour is for the ultimate food and wine connoisseur, packed into the striking Basque country in northern Spain are more Michelin starred restaurants and fine eateries than you can imagine and to top it all they are situated in one of the most alluring parts of the world. Stunningly beautiful countryside, wild, rugged coastline, dazzling waters, pristine beaches, diverse fauna and flora, striking architecture and rich heritage – welcome to the Gourmet Basque Lands! The gastronomy here is really something else; ultra-creative and daringly adventurous using the most diverse range of top quality, fresh local produce. We have prepared an awesome tour of this exceptional region taking you through the captivating lands, staying in fairytale castles and luxurious boutique hotels. You will have your own chauffeur driven luxury Mercedes throughout, so you can sit back and take in the spectacular scenery. You will have private tours and tastings at top Txakoli wine estates and artisan cheese farms. Experiment the diverse cuisine in numerous Michelin starred eateries, stay in postcard-perfect San Sebastian and artistic Bilbao, visit quaint fishing villages and medieval hamlets and the bewitching Urdaibai Biosphere Reserve. If you are looking for the ultimate gourmand experience, please contact us for more information on this incredible Basque food and wine tour. 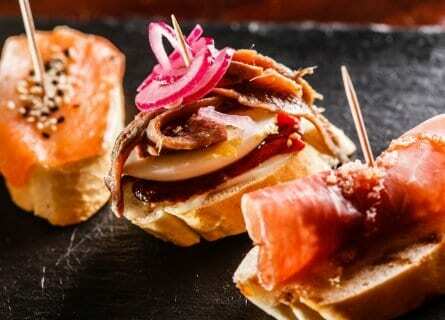 Welcome to the Gourmet Basque Lands! 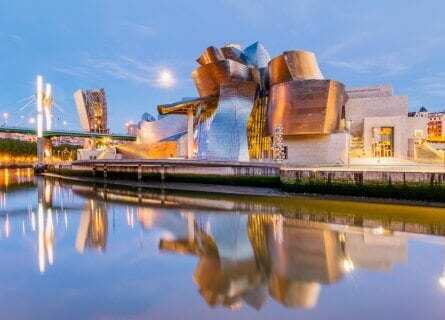 Arrive at Bilbao airport, where your chauffeur driven Mercedes will be waiting to transfer you to your hotel, and my are you in for a treat; your ultra-luxurious 5-star hotel, the Gran Domine Bilbao sits just across the street from the Guggenheim. Check in and check out your amazing view. (Please note, that the best start day for this tour is a Saturday.) You will have time to freshen up before you head for your welcome lunch at Nerua at the Guggenheim. This is a sublime start to your Basque gourmand experience, as Nerua proudly writes on their webpage “we cook with the freedom to create pleasure and enjoyment”. Faithful to our principles, we defend our environment and the producers who make our goal possible: to be at the cutting edge and to innovate without losing the flavor of our roots.” This is so true of Basque cuisine in general, they are innovative to the max if not to say risqué and you will experience combinations of ingredients and flavors that you wouldn’t have paired in your wildest dreams, but it works! Prepare for some utterly provocative concoctions such as “Prawn consommé, coconut milk and curry”, “Monkfish liver, artichoke puree and black olive juice”, Quail with txoricero, pepper and thyme or “ Avocado cream, chervil, grapefruit and banana ice cream” All meticulously created by Head Chef Josean Alija, who has a fascinating story- having always wanted to be a chef he started studying at the tender age of 14, but a terrible motorcycle accident put his career temporarily on hold as he lost his sense of smell and taste. Not allowing this tragedy to put an end to his career and passion he worked on analyzing food from a different angle, discovering different approaches which have led to him gaining a Michelin star and positioning Nerua in 56th position of the World’s Best Restaurants list. After lunch, settle in and enjoy a free afternoon and evening. This morning your guide will meet you in the hotel lobby at 10 a.m. make sure you have your comfy footwear on as you are going to discover the best of Bilbao by a privately guided walking tour. First stop will naturally be the Guggenheim, probably Frank Gehry’s most admired work of contemporary architecture. Your guide will lead you through the collection of European and American 20th Century to Contemporary paintings and sculptures. Next up is the Ribera Market, this huge covered market is fascinating with more than 60 posts with fresh meat, fish, shellfish, cheeses, cooked meats, and vegetables. Then you will meander through the streets of the old town the “casco Viejo” or “las 7 calles” the seven streets as it is known locally, these seven streets being what formed the original medieval town. Narrow streets full of bars and taverns and highlights include St. James Cathedral, the Plaza Nueva and the Bidebarrieta Municipal Library. Lunch is next at the striking Azurmendi restaurant, literally built into the hillside with spectacular views over the surrounding vineyards, here you will be blown away in many senses as this restaurant also boasts 3 Michelin stars. The elaborate creations may include Marine turnip with herb emulsion, Roasted lobster, and Iberian pork stew and whipped butter or Pigeon, duxelles, legume flowers, and beans all perfectly paired with some of the finest local wines. Then carry on to the Urdaibai Biosphere Reserve. UNESCO listed, it doesn’t take long to see why; the reserve has everything from phenomenal wetlands, dramatic cliffs, stunning beaches, forests, and woodlands, and some fascinating wildlife, in particular, some remarkable bird species scarcely seen elsewhere in the Iberian Peninsula. In the midst of this amazing landscape stands “Castillo de Arteaga”, now a delightful boutique hotel and your overnight destination. This neo-medieval palace was restored thanks to Eugenia de Montijo, the owner of the land when Eugenio Bonaparte, Napoleon the III’s son, was named native of Biscay by the General Assembly of Biscay in 1856, Eugenia, the Emperor’s wife initiated the restoration to show her gratitude for the honor. Firstly being overseen by a French architect, Courechet until his death and then by Ancelet, another architect for the French Royal Family. The result was a neogothic fortified tower inspired by French Gothic architecture. Settle in and make the most of your special surroundings, enjoy a glass of wine on the terrace or take a dip in their tower top pool, the views are quite something. Your chauffeur will collect you at 10 a.m. for a 45-minute drive west to another castle, the striking “Castillo de Butrón”, it can only be visited from outside, so enjoy the view and grab a photo, before continuing to your first winery of the day, Crusoe Treasure. Now, this is an unusual concept, where they produce a limited-edition boutique wine aged at the bottom of the sea in what is the first underwater cellar and artificial reef in the world. Your enthusiastic hosts will take great pleasure in showing you how the idea came about and how it works as well as talking you through the tasting of their unique liquid. Lunch will follow, a casual seafood lunch on the coast and then on to Bodegas Itsas Mendi. In the heart of Urdaibai Biosphere Reserve, Itsas Mendi is making a remarkable contribution to the history of Txakoli. After a tour of their gorgeous facilities you will taste the range from Itsasmendi, a young Txakoli, Istasmendi 7, a fuller bodied, more structured Txakoli capable of several years of ageing, Artizar which has been fermented in oak, Urezti, Itsasmendi’s sweetie, from late-harvest grapes and their delightful Eklipse, a fascinating blend of Pinot Noir and Hondarrabi Beltza. You will return to your nearby castle for some free time before preparing for your gourmet dinner here tonight. You will be invited to their beautiful cellar dinner for a private wine tasting. You can look forward to the likes of “Ensalada de langostinos, vinagreta de trigueros y centollo” (Shrimp salad with asparagus dressing and spider crab) “Entrecote laminado, salsa setas y crema mostaza” (Entrecote with a wild mushroom sauce and cream of mustard). All perfectly paired with local wines, Salud! Today you are in for some terrific views, a day of sightseeing in this enchanting part of the Basque country. 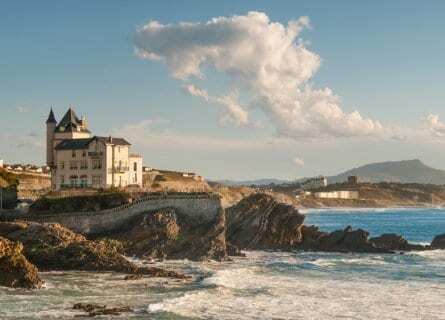 You will tour the dramatic Western Basque coast, and see why many places have featured in the Game of Thrones television series. 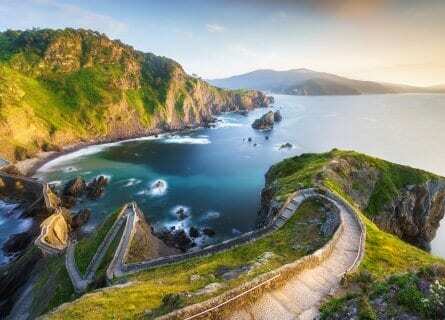 Dragonstone, or rather Itzurun near the town of Zumaia, will be your first stop. A guided walk along the Flysch coast is a highlight with the striking cliffs, fascinating rock formations, glistening waters and an immensely diverse array of wildlife. Then move on to San Juan de Gaztelugatx, its name literally meaning “castle rock” in Basque, is quite something with its zigzag walkway out to the little island. The 241 stone steps are worth the effort, being rewarded with the most impressive views and a little extra good luck, as legend has it that when you reach the church on top of the island you should ring its bell 3 times and make a wish. The church, steeped in history, is unfortunately not the original, having been burned down and rebuilt several times over the centuries. It was used as a convent for a while and later as a castle and defensive lookout. You will then visit the hamlet, Elantxobe, this tiny village has been a very important fishing port in the area, before continuing along the coast to glamorous San Sebastian, which will be your base for the rest of the trip. Check in and relax in your opulent hotel. Enjoy a free evening after such a great day, with our tips of course for restaurants and bars. Sightseeing in charming villages and artisan cheesemakers today. Your first stop is at the lively Ordizia farmers market, it is one of the oldest markets in Spain, having been held weekly since 1512. Today it still remains the most significant market for local producers as well as the abundance of fresh fruit and vegetables, the stands are brimming with delicious local cheeses, wines, preserved fruits, and honey. There is also an interesting Nutrition and Gastronomy center with information on the Idiazabal cheeses and local top chefs. 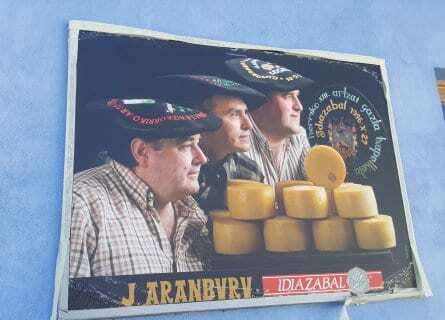 Talking of cheese, next you will move on to Aranburu for a visit and cheese tasting. Family run and proud Gold winner of the World Cheese Awards, here you will sample their exquisite range which includes both natural and smoked varieties with differing maturation. Then you will have the opportunity to get to know the wooly friends responsible for producing the creamy milk used in the production of Ondarre cheeses, tour the installations and picturesque grounds, before a sublime tasting, of course. Then back to your hotel to rest and freshen up before your gourmet treat tonight at 3 Michelin starred Akelarre. For over 40 years, Head Chef Pedro Subijana has been at the forefront of this renowned eatery. Winning its first Michelin star in 1978 and continuing from strength to strength. A sensational experience, the setting is stunning and each plate that is put before you increases in wow factor. Some of the delicacies may include; Lobster salad with Cider vinegar, Hake in Seaweed Steam with Plancton and Oyster Leaf or Carved Beef, Tail Cake, Potatoes, and Peppers. All perfectly paired with some exceptional wines selected by their attentive sommelier. A real highlight of your tour – enjoy! A 10 a.m. collection and you have a short 40-minute drive to the Txomin Etxaniz winery. This family-run estate goes back centuries and has been actively involved in the D.O. Getariako Txakolina. 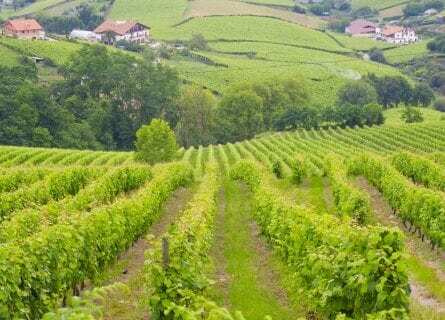 They have 35 hectares of beautiful sloping vineyards, looking out over the Getaria coast, planting both Hondarrabi Zuri (90%) and Hondarrabi Beltza (10%). They produce three wines a Txakoli; Txomin Etxanix, Eugenia their bubbly and Uydo, their sublime late harvest which pairs equally with savory and sweet dishes. A great aperitif to get your taste buds watering because next is lunch at the fabulous Elkano, another totally hedonistic experience for foodies. In the heart of the fishing village, Getaria, simplicity is key and whole grilled fish is the specialty, careful selection of the only the best quality raw materials and then grilled to perfection, providing a subtle smoked flavor to the fish, it just melts in your mouth! After lunch, a stroll around the delightful town of Hondarribia, this colorful harbor town has a fantastically preserved fortified wall encompassing the old town, which is full of pretty Basque houses with their wooden balconies, along narrow cobbled streets, mixed in with the odd building of baroque architecture adding to the attraction. Moving down to the marina, it is literally full to the brim with restaurants, bars, pintxo taverns and to top it Hondarribia boasts an 800m beach, this town really does have it all! 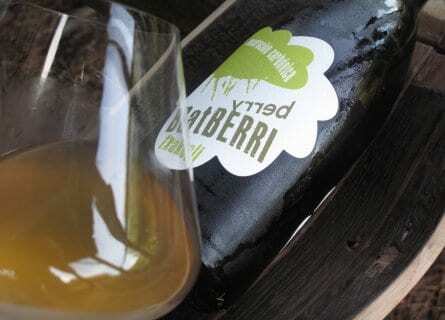 This evening you have a fun evening planned at a Basque Cider house, a rustic setting, but none the less stylish with beautiful gardens for the perfect al fresco cider experience. Less than a 30-minute drive from San Sebastian and you are in the French Basque country, quite different from the Spanish side, and apart from glitzy Biarritz most villages and small towns are beautifully rustic with their whitewash stone and red-timbered houses scattered along the rugged coastline, utterly charming. Your driver will first take you to the Chateau d’ Abbadia a fascinating neogothic Chateau observatory built on the cliffs of Hendaye by Viollet le Duc for Antoine d’Abbadie, ethnologist, geographer, and scientist. You will then move on to Ciboure, separated from St Jean de Luz by the harbor, Ciboure is an idyllic seaside town, lovely for a stroll, taking in the 16th-century Saint-Vincent church and sipping a coffee or glass of wine in one of the numerous cafes around the harbor. Then cross the bridge to St Jean de Luz for lunch at the dazzling Ilura Restaurant at La Reserve Hotel, here you will savor the wonderful flavors of French Basque cuisine, with the most spectacular views over the bay. Some of the divine concoctions might include; Milk-Fed veal from the Aldudes Valley with Baby Squid, Local Line-caught Hake fillet with bell peppers-paprika, squid ink and avocado, or Roasted-deboned “Kriaxera” Duck with Hydromel “Etxexuxen” consommé and young sprouts. After lunch, enjoy a spot of shopping, there are fantastic artisan and gourmet shops here. Then if you fancy working off some calories, you can climb the 248 steps to the top of the Biarritz lighthouse on Pointe-Saint-Martin; your prize at the end being the most unbelievable coastal views. 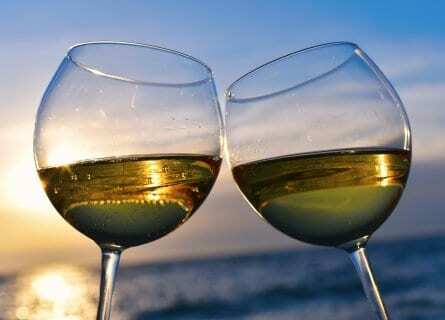 Then why not finish the day with a bottle of champagne at the Hotel du Palais, Biarritz, before your return and a free evening in San Sebastian. Make the most of a free morning to relax, potter around, hit La Perla Spa right on La Concha and then at 1 p.m. your bubbly local guide will meet you in the hotel lobby and take you on a fun walking tour, which will take in many of the best bars and taverns to enjoy the tapas and pintxos, washed down with a glass or two of wine of course. The rest of the afternoon is yours at leisure, maybe to get in some last minute shopping, before returning to your hotel to freshen up and get ready for your finale dinner. We have another 3 Michelin starred restaurant for you this evening; Berasategui you will have a blowout gourmet tasting dinner, guaranteeing that you leave the Basque country with a very clear idea, that here they really do have the best chefs in the world. Owner and Head Chef Martin Berasategui, was born into hospitality and took over the family restaurant after his father’s death when he was only 20, he continued to study in his free time and holidays, popping over to France to widen his knowledge and gained his first Michelin star, before eventually opening his own restaurant in 1993. 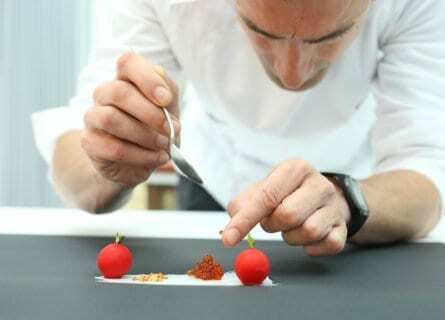 Martin doesn’t stop researching and innovating and each dish is an elaborate masterpiece. This is a sublime way to end your gourmet Basque food and wine tour! Enjoy a terrific breakfast at your luxurious hotel and at your preferred time your private chauffeur will take you to Bilbao airport (or other port of call) for your outbound transfer. We hope you enjoyed your stay in the beautiful, gourmet Basque Country!